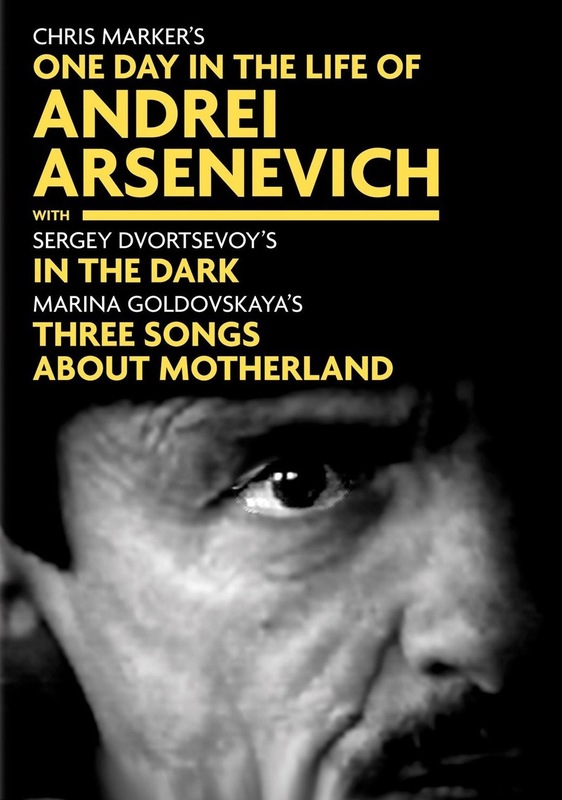 On the occasion of the death of French film-maker Chris Marker (nee Christian François Bouche-Villeneuve), I’m reposting (and slightly cleaning-up for “cold reading”) a review I wrote years ago on Super-Secret Nerd Group, on Marker’s ONE DAY IN THE LIFE OF ANDREI ARSENEVICH. While Marker’s LA JETEE is his best-known film and also very much worth seeing even to people without an existential stake in the history of the French Left, I honestly prefer ONE DAY. I have the film, which was an episode of the French series “Cinema of Our Times,” among my Top 10 films for 2001, though I only saw it a couple years later, on either the Sundance or IFC channels. What makes ONE DAY poignant on this day (I may watch it again in the next few days) is that it films a dying Andrei Tarkovsky during the production of his valedictory and very-much-about-death film THE SACRIFICE. As I mention, Marker even shows Tarkovsky directing the French crew from what could well have been his death bed. Kicker: the expiring Russian was 10 years younger than Marker. May both men RIP. 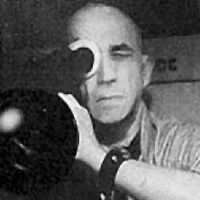 Or if you want film criticism on film, you should watch Chris Marker. As in ONE DAY IN THE LIFE OF ANDREI ARSENEVICH, which is the greatest use of film as film criticism I’ve ever seen that doesn’t involve remaking the same movie five times over. And THE FIVE OBSTRUCTIONS, which I placed #2 for 2004 (the year of this posting), and ONE DAY are just so different in their sense of what “being film criticism” is about, that any direct comparison is pretty silly. But man was ONE DAY awesome — and don’t by any means speak as the world’s biggest Tarkovsky groupie (I’ve come around on him even more in the eight years since I wrote this). But what makes ONE DAY awesome is that it’s formally accomplished (not dazzling by any means, but done with as much imagination and style as the average fiction feature); it gives you a sense of Tarkovsky the man, and gives a good overview of his career that has serious critical insights that go beyond the highlight reel of the average artist bio. Even though I’ve come around to the view that ANDREI RUBLEV, STALKER, THE SACRIFICE and SOLARIS are great films, (I think) J. Hoberman was right to point out that Tarkovsky’s films have to be seen twice or not at all. 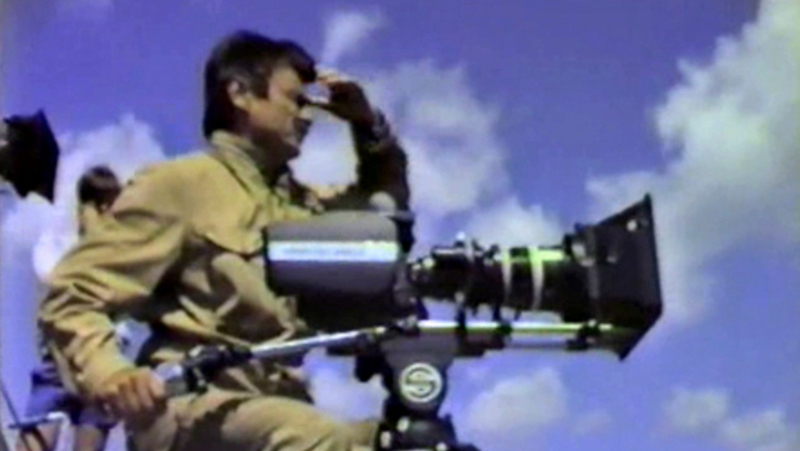 In fact, to be honest, if someone just getting into art films were to come to me and ask “where should I start exploring Tarkovsky,” I would actually say with Marker’s film rather than any of the Russian’s own. As for Tarkovsky’s working personality, it’s what’s you’d expect from his films — a perfectionist who leaves nothing to chance, a man who was directing literally from his deathbed, even directing Marker. But Marker himself also directly links the working method with the final product. In one scene, for the incredible final shot of THE SACRIFICE, we see Tarkovsky meticulously directing and blocking his actors. But Marker also inserts cutaways from THE SACRIFICE inside the documentary frame, showing the actors doing what Tarkovsky is telling them. Marker links AT’s biography to Tarkovsky’s films constantly — the opening shot of his film being an early shot from MIRROR, focusing on the actress’ hairdo and how it makes her look so like Tarkovsky’s wife. He also outlines some of the major themes and obsessions — weather, paintings, mirrors. And it’s not so much that Marker does or says anything really new, but more that he illustrates it with *well chosen shots* — there’s just no substitute for this, and it’s why film criticism via film could be so promising if anyone could actually take an interest in it. Marker also talks about the worldview of Orthodox Christianity and how it’s linked to Tarkovsky’s typical camera angles. For example, Marker (or I guess Alexandra Stewart, the English-soundtrack narrator) describes the “Pantokrator” icon, typical of Orthodoxy, but rare in the Western Church — basically it’s a painting of Jesus looking straight down from inside a church’s dome (or a God’s eye POV). And this description accompanies camera movements that glide into that position — in THE SACRIFICE, SOLARIS and ANDREI RUBLEV. And if you’ve seen the movies, you also realize the plot points make Tarkovsky’s shot not accidental or for show. Respectively, it’s the one shot of The Apocalypse, the final revelation about the planet, and a grace-full God blessing the bell-casting that the boy didn’t know. ONE DAY also (unintentionally) gave me one reason a sense of why I was resistant to Tarkovsky for so long. (His first two, least-Tarkovskyish films — THE STEAMROLLER AND THE VIOLIN and IVAN’S CHILDHOOD — are the only two that I can unqualifiedly say I enjoyed on first viewing.) But as an unrepentant urbanite whose idea of natural beauty is green concrete, the fact that nature, and the four classical elements, has such a dominant presence in Tarkovsky’s films didn’t acclimate me to them (I once joked that the rain was the only thing that kept me awake during some of them). That’s what elevates ONE DAY about the ordinary “fan letter” artist bio (like, say IN THE MIRROR OF MAYA DEREN, as much as much as I unexpectedly liked that AS an intro to Deren for a non-avantgarde fanboy). ONE DAY is a great enough piece of criticism to give, without engaging in negative polemic, a real sense of what somebody (the me of the mid- and late-90s) *doesn’t* like about Tarkovsky. What an achievement THAT is.